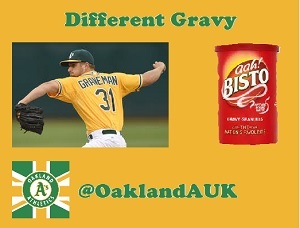 As I’ve got the day off work and can’t think of anything but baseball, I thought I’d do something vaguely useful with my time and look ahead to the A’s opener tonight at 21:05 BST. After inheriting the Opening Day assignment in 2017 due to Sonny Gray being ill, Graveman will take the mound this time as the A’s nominal ace. I say nominal ace as even the most optimistic A’s fan wouldn’t really put him in the ace bracket, but he’s the leading starting pitcher among our current crop alongside Friday’s starter Sean Manaea. Looking back at his Opening Day start a year ago, Graveman did a decent job in limiting the Angels to 2 runs over 6 innings. He did that throwing his sinker almost exclusively. There were a few cut fastballs thrown in here and there, yet otherwise it was sinker, sinker, sinker. Other 4%: varations of a fastball. As with most pitchers, the overall numbers obscure the different approaches taken against right or left-handed hitters. Against righties he went to the sinker almost 80% of the time, then 10% cutter, 10% curve (very occasionally chucking a change into the mix). Against lefties, he significantly increased his cutter (23%) and change-up (22%) usage, bringing his sinker use down to approximately 50% and then throwing a few curves in here and there. For those new to baseball, that’s quite typical among pitchers. A right-handed pitcher will tend to use a curve against a right-handed hitter and a change-up against lefties, and vice versa for a left-handed pitcher. The Baseball Savant website does a great job of visualising how a pitcher has approached different hitters and the outcomes of that. Here’s a link to the page for Graveman’s work against the Angels. I suspect Jonathon Lucroy will be in the line-up instead of Maxwell, but we’ll find out soon enough. The game is scheduled to begin at 21:05 BST and is available to watch online for MLB.TV subscribers. Join myself and the rest of the OaklandAUK fanbase on Twitter tonight.